Titled Hang ‘em High, this novel takes place on a dude ranch in Montana. When Ida Mae’s son invites her to come for a visit, of course she brings Arlette and Tansy along with her. They are expecting to spend the week looking at horses, avoiding the cows, and making amends in Ida Mae’s relationship with her son. What they don’t expect is to be stuck on the ranch in the middle of a blizzard and to be thrust headlong into the middle of a mystery. *** Help Tristi celebrate her new novel in two ways. First, come participate in the two-week-long blog contest, where you can win a book nearly every single day! All the details are up on Tristi’s blog. Who says Harry Potter is dead, books or movies or otherwise? Not me. Not my kids. Three of the four are rereading different books from the series. They all want to watch HP 7 part 2 again. What an amazing empire Ms. Rowling has created! Are you a music lover? What kind do you love? Do you listen to music while you clean? Do certain songs feel like summer to you? (I Wear My Sunglasses at Night; Boys of Summer)(totally dating myself?). Big question: What do you listen to while writing? There's an app on my iPhone that sounds like I'm relaxing and writing on the beach: waves, seagulls, and a soft wind. I also tune into classical music. I understand it helps make me smarter so it can't hurt, right? I love Mozart and Sate. Sometimes I forget to turn on the noise and quiet works for me too. I first came across the idea of a playlist with Stephenie Meyers. The music fit with the mood and characters of the book. Many of her songs on the lists also made it into the movies. Every few days I like to mix up my writing with a playlist I made for the story I'm working on. I'm submitting a YA Sci/Fi this month so some of the songs are not ones I normally listen to but they fit. Tyler Whitesides has brought a fresh voice to middle grade books (and it's his first book!) in JANITORS. Funny, intriguing and lessons/consequences learned. I was lucky enough to get a SIGNED ARC from Tyler and I'm passing it along to you! I only ask for a little help. I posted the giveaway on Book Addict with a question for you to answer at the end. 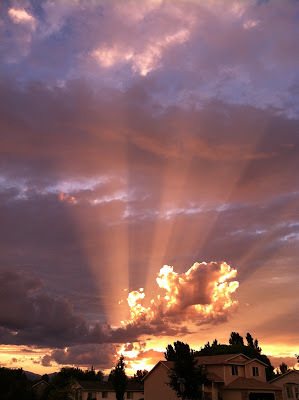 My book review blog has stopped at 57 followers for a few months. 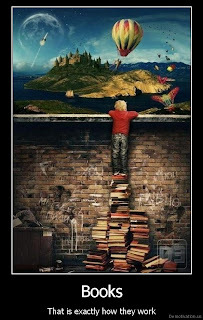 Would you mind going to The Book Addict and becoming a follower? Then answer the question at the end of the Janitors giveaway blog. THANK YOU! Check out Tyler's website here. 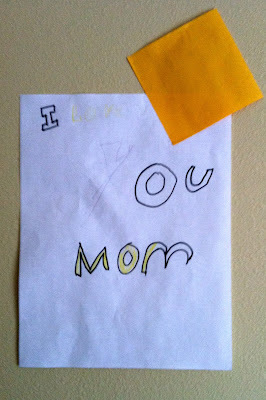 This Mother's Day letter looks like it says, "IOU Mom"
It really says, "I Love You Mom"
Ah! The power of letters and words. Isn't this a great picture? I was on a short holiday with three other ladies when we spotted this window display, The Abominable Snowman. It drew us inside (I call this impulse marketing) to take a look around. The owner came from the back room through swinging doors and greeted us with a big, cheery hello. We asked about the display. She said the beast is all edible. Everything in her bakery is edible, she said. Even you, I joked. It took her a second to catch my meaning. Even me, but that's just gross. She had a greet array of cookies, cupcakes and cakes. We all bought something scrumptious to gain three pounds eating. 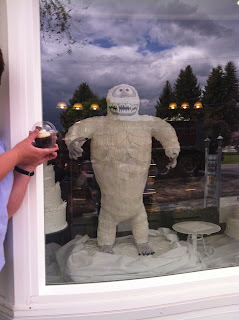 Our bakery friend told us she'd always wanted to craft an Abominable Snowman cake so she did. She worked on the design and molding and colors and made her dream a reality. She has her cake and she can eat it too (I had to put that in there!). My Harry Potter Blog Party Giveaway today! Anyway, I guess you're here because of Inksplasher holding her HP blog party. Let's get to the good stuff! JK Rowling's talent as a storyteller is amazing. And magical. Writers can weave their own magic in their own way. I'm giving away TWO prizes which means TWO winners! But you only have to enter once! YaY! PRIZE #1: Tom Riddle's A Writer's Journal! Welcome to the Harry Potter Party! 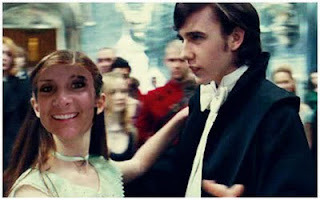 How many of you lucky readers get to see the Harry Potter movie this weekend?? Yeah, I didn't get tickets either. But that's okay because we are going to have fun this week! On FRIDAY I'm giving away TWO prizes which means TWO winners. You can choose a cool journal and pen or two writing books. Thanks to Inksplasher for hosting the party! She has all the details so hop over to her blog for all the details. The party starts today, Monday, July 11th and goes through Friday, July 15th. oh! What do you do in the summertime? I LOVE to read during the summer. We have a small local pool we frequent (3xs/week) and I read and read and read. I also take a notebook and write. My muse lives at the pool. Here is a small pile of books in my summer reading pile. I've already added about eight books since this picture last week. What do you do in the summertime?? 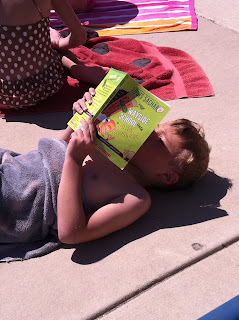 What can a momma say when her own child WANTS to take a book to the pool and read? ?